I know, I get excited about a lot of recipes (hey, that's why I am a food blogger ), but this? Delicious, amazing, fabulous, epic, legit.....am I getting my point across? I might just need to invent a word to really hammer it home! So I knew I had to go down the savory route, but what to make. I already have a Beef and Mushroom Pot Pie, and a Chicken Pot Pie Soup, so I wanted to do something completely different. Being that I live in the Seattle-ish area, salmon is one of my fave things to eat. So that stuck in my head. But I really wasn't sure what everyone would think about a fish pot pie. Then I was at the new market we have here in town called Main & Vine. They are all about sourcing local, and sustainable products. I seriously love this place! I think I spent about 2 hours just wandering around the store, Kevin thought I had gotten lost because it took me so long! They had salmon on sale for $4.99 a pound......yes, I said $4.99!! At that point I decided it was a sign from above that salmon pot pie needed to happen. A few organic veggies, and pie crust, later and I was on my way home with a mission. Friday is the day we have the G-baby, so I decided that would be the day I would make this recipe because I would have guinea pigs, errrr volunteer taste tasters available. If they gave me any trouble I would just keep the baby right? Seemed like a pan to me! However, there was no such issue involved. I had just gotten done with the photos (oohh what do you think of my photos using the new lights I bought? ), and Kevin had just begun to dive into his bowl, when the kids got here. Seth went straight to the kitchen to try it out. My boy has priorities The next thing I hear is him yelling "Heather.....Heather......HEATHER". When she walked into the kitchen he shoved a HUGE spoonful of the pot pie into her mouth. Her reaction reminded me of Kylee when I feed her. Pause......smile.....MMMMMMMMM!! Later, after the kids were gone, and Kevin and I were sitting watching TV, He looked at me and said, "That pot pie is really amazing". I thanked him and he said, "No, seriously, it was amazing". The next day, when were eating breakfast, he said,"I am serious, that pot pie was awesome". I guess that means he really liked it. But I do have to agree with him. I could eat this pot pie every night for the next week, and not get tired of it!! Salmon, enveloped in a rich creamy broth, all covered in a light and flaky crust. 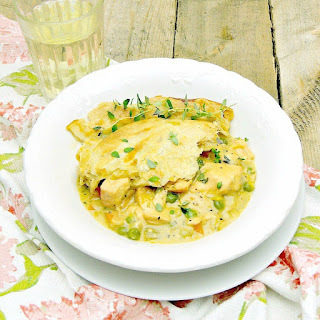 Move over chicken pot pie, this salmon pot pie is going to take your place as the family favorite! Preheat oven to 400 degrees F. Let pie crust stand at room temperature according to package directions. In a large skillet melt butter over medium heat. Add leeks, celery, carrot, and garlic; cook, stirring often, for about 8 minutes, or until the leeks are very soft. Whisk in flour, salt, and pepper. Add stock, stirring constantly, bring to a boil. Add the salmon and cook 1 to 2 minutes, until fish becomes opaque. Remove from the heat. Add the heavy cream, thyme, and peas, and spoon into a greased 2 1/2 quart baking dish. Top with the pie crust, trimming the edge to 1-inch over the edge of the casserole dish. Brush the pie crust with egg wash.
Bake for 20 to 25 minutes, or until crust is golden brown, remove from the oven and allow to cool for 10 minutes. *Cook's Note - If you can not find fresh or frozen salmon, you could sub canned salmon. Just flake it into big chunks, and carefully stir so you don't break it up too small. Wow, Bobbi! You had me at 'salmon'. I can't wait to try this pot pie. 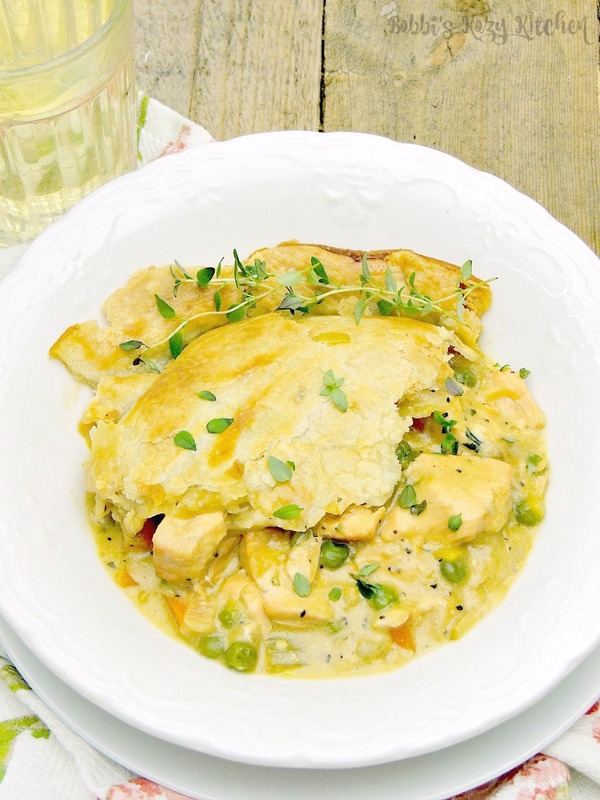 Yes, salmon is our fave, and this pot pie just let it shine!! Oh! Em! GEE! Only 4.99 a pound? No WONDER you made this! I have no words either other than I can't wait to make this! Yay!! I know you will love it Sara! 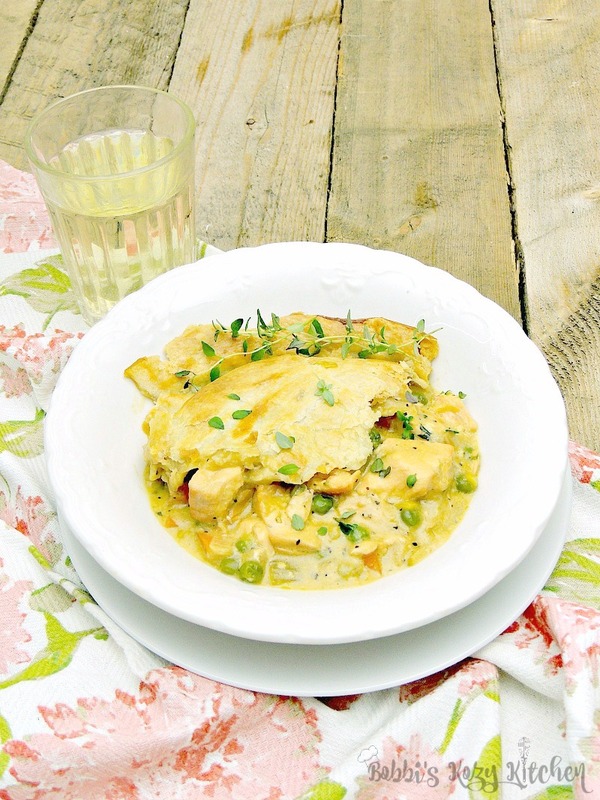 This looks so amazing, and it's such an awesome twist on the classic pot pie. Sounds delicious, I can't wait to try making this! Oh yes! I hope you make it soon!! I've had lobster, chicken and beef but never salmon pot pie. What a fabulous idea. I've had lots of pot pies but never one with salmon. I am intrigued. This recipe looks easy and delicious. Oh yes, it is very easy, and soooo good! What a great idea! -- We eat salmon at least once a week and this would certainly shake up our usual routine! Looks yummy! Oh I can't wait for you to try it Lisa! We've made a lot of different pot pies, but never thought of salmon. What a unique idea! I've heard of fish pie but never tried it. 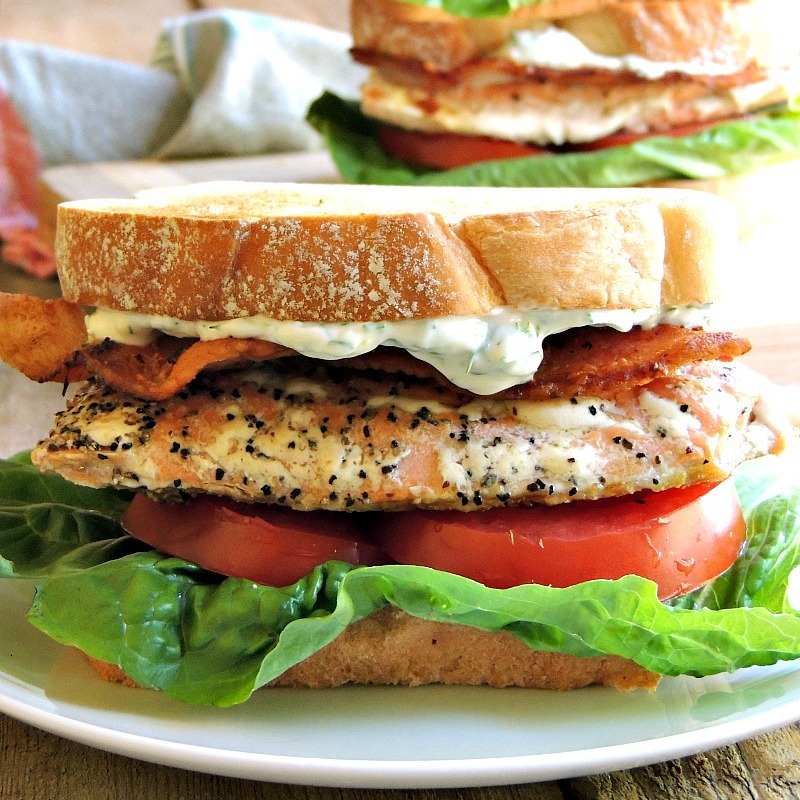 This looks so good I'll have to make it! I have never had a salmon pot pie....but I love pot pie and salmon so this sounds great to me. This looks delicious! I've never had fish in a pot pie, but I think I'd like this! I have to admit that I was a bit nervous about the idea, but it was so amazingly good! I would be getting excited too, looks amazing. 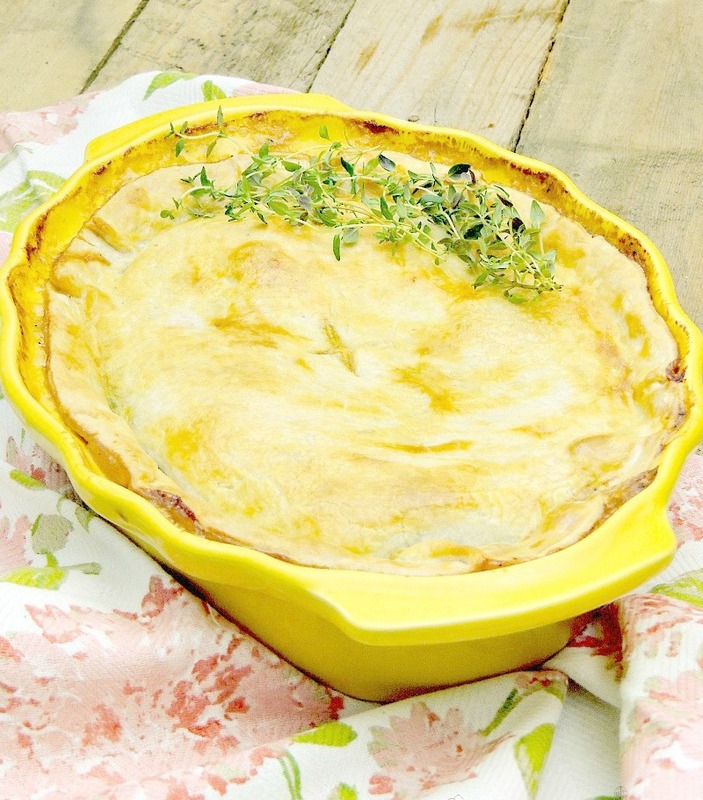 I love a pot pie and that is on my agenda this weekend to make. Never made it with salmon. Looks delicious. What a great way to enjoy salmon! 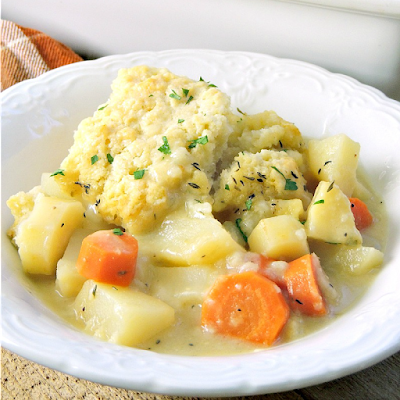 A great recipe for Lent and any Meatless Monday! I haven't had a fish pie in about a year! Yours looks really good, Bobbi! I had shared your post on my Facebook group and I will try this recipe next week. Thank for post here ! Just reading your recipe's makes my mouth water. I Love it. Looks delicious! Can't wait to try this recipe. Thanks for sharing! 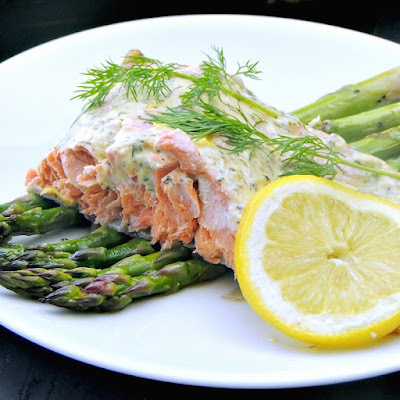 Great recipe Bobbi, can we use Air Fryer to Cook Salmon? I have never used one. 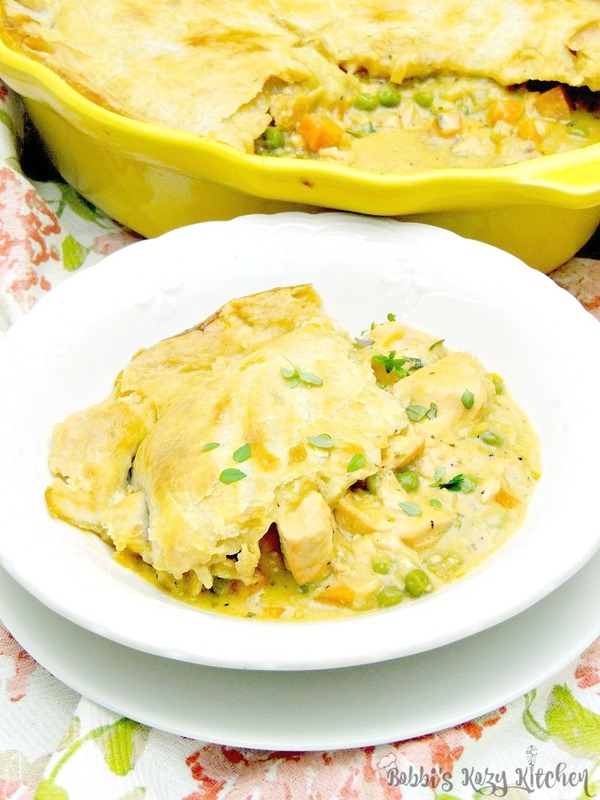 In this recipe the salmon cooks in the pan with the pot pie filling. i also love pot pie recipe..
Salmon? OMG, that sounds fantastic. I love that your recipes are so different everything else I read. I always enjoy checking out your posts.